Photo by Heather Ziegler Eric Freeland examines the fruits of his labor in one of the berry gardens at his Windsor Heights farm. WINDSOR HEIGHTS — High atop Windy Hill in Windsor Heights, Eric Freeland is working a little magic on a couple of acres once farmed by his grandparents. For 40 hours a week, Freeland works a construction job. He is known for building some of the best model railroad displays in the tri-state area. When that work is done, he heads into his organic gardens where he is producing berries by the bushel. Raspberries, black raspberries of various types, along with succulent strawberries can be found among the meticulously kept rows of plants, some growing 8 to 10 feet into the air. “It’s hard to imagine that these plants start out looking like sticks in the dirt. Then they grow into these amazing bush-like plants with hundreds of berries,” Freeland said. Freeland’s berries are gaining in reputation and demand. He takes pride in his produce — from the delicate king black raspberries that are hard to find locally, to the red raspberries he produces from July through October, golden raspberries and purple raspberries, and his ever-bearing strawberries he harvests through October when the weather cooperates. He has partnered with Grow Ohio Valley to provide berries for their marketplaces. As well, his berries disappear quickly when he sets up a stand at Oglebay’s Monday evening summer farmers’ markets. Wilkins Flower Shop in Wellsburg also requests his berries to sell to customers. And plenty of the healthy berries are placed in bags and kept in the freezer for his personal year-round consumption. “Most people use the berries for desserts, baked in pies or whatever. I put them in smoothies and eat them by the handfuls. They are a super food and I feel great since making berries a big part of my diet,” Freeland said. The work that goes into producing hundreds of baskets of raspberries, black raspberries and strawberries each year has many benefits, he said. First, he is carrying on the farming tradition of his ancestors on the farm. Second, he is producing a viable crop that is in high demand. Third, he also is partnering with the West Virginia University Extension Service which studies his gardens, crops and farming techniques to determine the best outcome for berry growing. It also allows students to study firsthand the berry farming production. And, fourth, the added health benefits are a plus — fresh air, exercise and a delicious bowl of berries. A field day is slated at the farm on June 17. Registration is required to attend by calling the Ohio County Extension office at 304-234-3673. Freeland is a voracious reader of books and internet articles, and seeks out information about berry production. Partnering with the Extension Service is a win-win situation, he said. The students and staff who visit his farm and study his crops and planting techniques also offer their expertise. Freeland, however, is well-versed in the berry business. He has rain collection barrels he uses in his irrigation system installed throughout each garden bed. Composting and proper nutrients for the soil also are important to growing berries, he said. “I make a lot of compost and I use mushroom compost I get at Yensen’s (Landscape Supply) at The Highlands,” Freeland said. Keeping pests from the berry beds is not a big problem as the gardens are fenced in and his two dogs roam the fence lines keeping out the deer, groundhogs and other damaging wildlife. “The greatest threat I have is the wind up here. Some of those berry plants can grow pretty tall and some of the high winds we’ve had has caused some to break off. I just cut them back and start again,” he added. 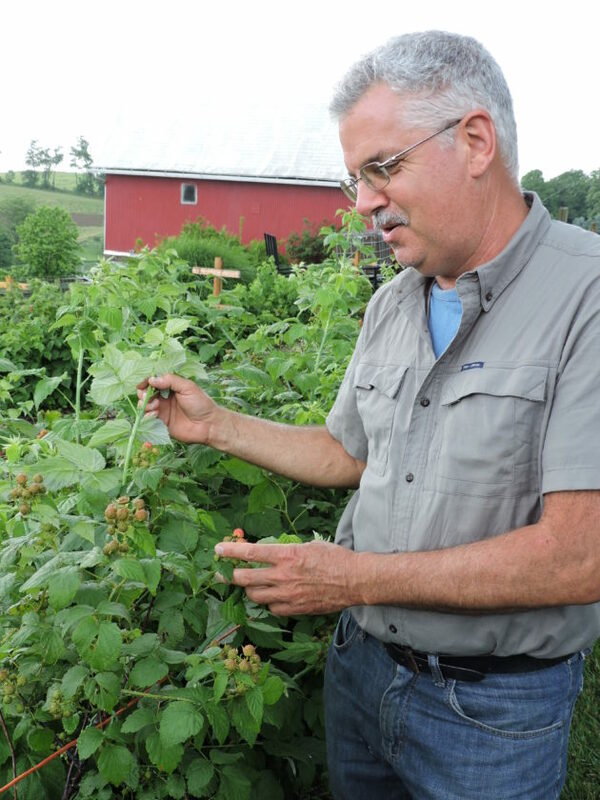 WVU Extension Service agent Karen Cox said the June 17 field trip to Freeland’s farm will allow other interested growers to see firsthand how feeding the soil and keeping things clean helps to grow flavor filled, healthy and beautiful berries. “For those attending the field day, we hope they learn how to better care for their gardens and how to produce a better outcome. “For those who are not growers, I hope they leave with a better understanding of how much goes into it and why it’s important to buy locally,” Cox said. A WVU horticultural specialist who visited Freeland’s farm last week was impressed with the number of varieties grown on the farm. Cox said Freeland has a passion for what he does and an immense knowledge of the process. “He believes in the adage that if you give it time and love, it will come back to you,” Cox said.